Perhaps they're misled by the spelling -- "well, I have to spell 'beber' and 'vivir' with different letters, so there *must* be a pronunciation difference between their consonants....". A bit like how I used to think that I had the DRESS vowel in the first syllable of words such as "examine" -- due to the spelling with an "e". After seeing it with KIT in the dictionary and paying more attention to what I'm saying, I found that I actually use KIT there and that I had been deluding myself previously. Similarly with "front" and STRUT (rather than LOT) -- again, the spelling misled me as to what I was actually saying. Back when I was first taught English, we did use some IPA, and it was used in some of my attempts to learn French (but never German). That said, I didn't pay enough attention and I have only really learned English long after that intial instruction, so I have oodles of spelling pronunciations still. I *know* (now) that "English" only has the KIT vowel, but I still use DRESS and ... something like a short FLEECE, but higher than KIT. And I still find myself incapable of properly reproducing STRUT. 'Arabic for Dummies' offers this advice for producing the consonant dhah: ‘take the ‘th’ as in ‘those’, and draw it to the back of your throat.’ Presumably you have to swallow your dentures. Presumably you have to swallow your dentures. No, that would be a(n) `ayin. Ah yes, "layman's" explanations of pronunciation are often pretty terrible. I struggled with precisely this issue in Serbian, although fortunately I had purchased the CD with spoken examples. I would like to see more language books use the correct phonetic terms and symbols to allow the reader to do further research, but I think that this should be in addition to an attempt to explain it for the layman. Perhaps what is needed is a standard (well thought out by phoneticians) layman's guide to IPA which can be reproduced in language books. You didn't even mention the problem that jumped out at me: they use "ch" to mean both /x/ and /tʃ/: gente is "chehn-teh" and jamón is "chah-mohn", while chorizo is "choh-ree-tho". As for "aspirated", it is true that people used to refer to spirantization as "aspiration", and still do in some contexts (such as the "Aspiration Mutation" of Welsh, which changes /p t k/ to /f θ x/). English-speaking laymen also seem to be at a loss to describe voicing: in choirs I've sung in I hear voiced sounds described as "soft" or "vocalized" or "weak" and voiceless sounds correspondingly as "hard" or "unvocalized" or "strong", but never as "voiced" and "voiceless". But in German-speaking choirs, people use the correct German technical terms "stimmhaft" and "stimmlos" and the laymen understand it just fine. Pronunciation guides do not use IPA because it is offputting to people as they do not understand it. However, if it were more commonplace, people might begin to understand it. I believe it's a very useful tool and should be taught in schools. But using a "funny sign" instead of a simpler system of recognisable letters with diacritics doesn't make a difference if you still explain the respective signs' meaning in an impractical way. It would be too much to teach the entire IPA system with quite a bit of theory on top. It's the teachers and the authors of textbooks who should have a notion of phonetics. A student of mine recently commented that she found it easier to pick up Welsh soft mutation than many of the other people in her beginners' class because she knew some phonetics. Instead of having to remember that (orthographic) "p, t, c" change to "b, d, g", she simply noticed the voicing change from [p t k] to [b d ɡ] (she also worked out that "u" represented [ɨ]). Given the amount of time people commit to teaching or learning a new language, it doesn't seem excessive to have a small amount of basic phonetics for the potential payoff. My own Spanish pronunciation improved no end after I read the introduction to a dictionary which used IPA notation (this was years before I'd come across IPA in any other context). Wikipedia uses IPA widely (if not always perfectly correctly). See, for example, http://en.wikipedia.org/wiki/Spanish_phonology I have the hope that this will popularize knowledge of the symbols. I remember very well your clear-cut explanation of the Spanish plosives which you gave in your phonology class at UCL in 1987. Your words posted here remind me of my happiest days at UCL. 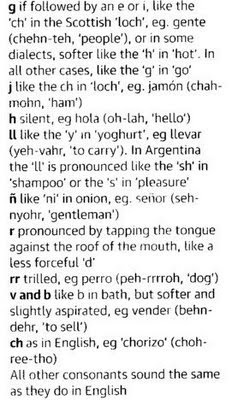 It's particularly funny that, although in chorizo they show that the 'z' is pronounced as 'th' in English, there is no mention of this in the pronunciation guide. Although perhaps it's in there with 'c', and Mr. Wells didn't copy that part? @Kilian: Yes, 'z' is covered, though listed after 'c' and before 'g'. Realistically, it's not SO depressing. A) the material in question is a giveaway phrasebook, NOT a textbook; B) Outside university lecture halls, imitation seems to be the universally accepted way for human beings to learn languages; even babies, the archetypal [ahem] "naïve would-be learners" can manage it. And generally, with imitation, we appear to engage the necessary mechanisms for filtering out any imprecision of initial examples: for example, we learn from our parents' regional accents yet quickly understand even BBC English. Written guides for imitation will, by their very nature, always be imprecise or slightly misleading, but real phonetics and IPA are an unattainable goal for all but "eminences grises" - and they would be totally over the top in a pull-out aimed at helping Grauniad readers get around during their two weeks in a finca outside Ronda or trekking in Patagonia (at which juncture, of course, the Argentinian y-sh change IS vital to know because it's a vast and incomprehensible difference, and because many crucial "first words abroad" contain the ll - llamar, calle, ella/ello, llegada, and so on). To take issue with a couple of other specific points from the perspective of a layman naïvely learning Spanish in Seville by imitation: the Guardian's b/v seems (despite the word "aspirated", which I can skim or guess) a clearer, simpler starting point and closer to what I hear in the streets than your revised example... try as I might, leaving aside the "after m or n" bit, I cannot pronounce an English v using "the two lips" (at least, not without hearing you do it first and imitating the sound you make that corresponds to that description, which rather defeats the purpose). I get a b every time anyway, so why not just say, "For the duration of your hols, any v is a b". Which is more or less what the Guardian does. And then, after bringing me my cafe solo, if the waiter asks me ¿algo mas?, I'll also try "nada, gracias" with the "th in father", but I reckon I'll be given a pot of cream, not the "nothing" I had in mind. If I stick to "naDa" with a good hard D, the waiter will know I'm a guiri, but at least he won't bring me anything else. I'm tempted to say as a result that real phonetics and IPA still need imitatable examples for them to be absorbed, and that the pronunciation errors that one can make through an inaccurate use of more punctilious written information can have slightly worse consequences than those one makes starting from an obviously approximative, but infinitely simpler starting point. And a Guardian phrasebook is exactly that - a simple starting point. Not a PhD. Won't comment the rest, but I never noticed that Spanish nada could be understood, say in a Latino café in Boston, as 'nother. Am I the only one who thinks it odd that everyone expects English speakers to know how "loch" is pronounced? Where I live in California, it's much more common to know how to pronounce Spanish than Scottish. I struggled to learn German from books as an adolescent, but those books were hopeless. That's the point. The tradition of explaining the sound as being the one in loch wasn't established on Californian soil. Educated Englishmen were likely to have heard the words loch and Bach, at least in the respective seasons. A danger in telling Californians that it's "like the Spanish j" is that while most are used to local Spanish place names with j, the standard in English is to replace it by h. Roughly: [sæn hoʊseɪ], not [san xose]. Forgive my very rusty IPA (It's been nearly thirty years since I've had to use it), but I think that's pretty close to the way we say it. Still, it's pretty common here to have a semester or two of high-school Spanish. And of course, growing up "the bookworm" in a small blue-collar town, my vocabulary included hundreds of words I had never heard spoken aloud. So I was doubly disadvantaged as a ten-year-old trying to learn German from books and tapes. In retrospect, I think the books all assumed the readers had studied Latin. This calls to mind my first experiences of learning Scottish Gaelic. Textbooks such as the old "Teach Yourself Gaelic" attempted to use English-based imitative pronunciation and only served to cause confusion even to one who at that time did not as yet know the realities of this language's exotic and vast sound system. Since the overwhelming majority of the consonantal sounds of Scottish Gaelic do not exist in English the authors' attempts to ignore this problem were never going to succeed. And everywhere was the same annoyance that John writes of, writing "aspiration" for (grammatical as opposed to phonetic) lenition. The charmingly named "Scottish Gaelic in Three Months" was a shining exception, using real IPA throughout. My interest in phonology and phonetics grew out of the these books both good and bad. Yet it still seems to so often be the case that authors believe that is preferable to either omit writing about matters that are essential, or delivering a tale so mangled as to be misleading or bewildering, rather than take the risk of telling the student a story that is in judged "hard" or "technical". It's even more annoying when you're typesetting introductory grammatical material including a pronunciation guide and you're told that you can't use IPA because the children don't know it and it will "put them off". Here in South Africa the standards of language have dropped. On Tv you find written comments with spelling mistakes, people using is instead or are and vice versa. How are our kids ever going to learn english properly if the media to start with and their school teachers don't know where to use is and are. I and my wife pull our hair out listening to our language being savaged! i'm a new guy here..
just want to know about "loch"- "X"..
is "loch" the only word that use "X" in English? ?